Trimble (NASDAQ:TRMB) introduced today its WaterWell Monitor solution for the collection of groundwater level data to support environmental managers and consultants, landfill owners/operators and site operators. The solution provides increased efficiency in data collection and management for monitoring water wells at landfills and remediation sites. Fast data entry, onsite verification and GPS navigation streamline the monitoring process to improve productivity and reduce rework. 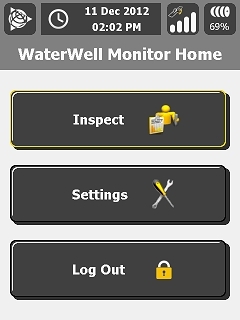 Trimble WaterWell Monitor provides a complete field solution for digitally recording and managing monitoring information on water well levels. The software makes it possible to set up and manage information on individual wells, collect field data and deliver the results. Running on the rugged Trimble® Nomad® field computer, Trimble WaterWell Monitor provides guidance to a well, point-of-work information and data checking in the field. The simple user interface and field-tested workflow minimize training and startup time. To monitor a well, the field technician chooses it from the filtered list of wells to be monitored. The solution uses the Trimble Nomad internal GPS receiver to guide the technician to the correct well. Water levels can be measured manually or using supported automated water level sensors. In both manual and automated operation, the software allows for two measurements of water level to be recorded, with automatic alerts if user-specified site tolerances are exceeded. With a cell modem and Trimble AccessSync, the technician can transmit field data directly from the Nomad in the field to secure cloud storage during the monitoring event, reducing the chance of data loss. The Trimble WaterWell Monitor solution is expected to be available in late February, 2013. Contact Trimble’s Environmental Solutions sales team for more information on the WaterWell Monitoring solution at: environmentalsolutions@trimble.com. Trimble’s Environmental Solutions Business is a leading innovator of productivity solutions for the environmental services professional. Trimble’s solutions target businesses operating in the environmental services, waste management, remediation, reclamation, environmental consulting and environmental equipment markets to improve workflow, increase productivity and reduce rework on site. For more information, visit: www.trimble.com/environmental-solutions.